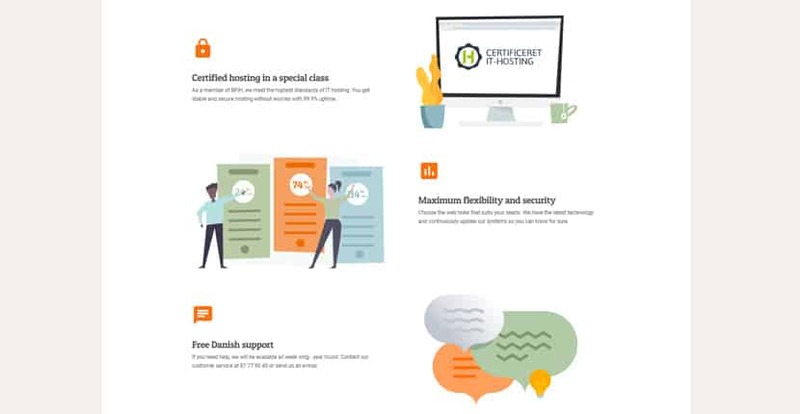 DanDomain Review 2019: Is DanDomain a Good Hosting? DanDomain offers high amounts of memory and storage that enterprise companies will love but smaller e-commerce stores may need to grow into. DanDomain is a web hosting company based out of Denmark. They were founded in 1999 and specialize in e-commerce websites. They currently handle more than 500,000 registered domains and boast a client list that includes well-known industry leaders such as WWF. Their website is in Danish and they only offer native Danish language support. In addition, their shared plans offer specialized feature lists for webmasters, depending on whether you use a Windows or Linux OS. Plans begin with 5GB of disk space and no MySQL support. Limits can be increased to up to 50GB of disk space and 5GB of MySQL database storage. DanDomain places an emphasis on e-commerce functionality as a value-added service. They offer specific integrations for all of the most popular extensions for online stores, including WordPress and Drupal. For Magento, you can have DanDomain take care of the technical setup of your website, and then also enjoy ongoing technical support to help you with platform-specific problems. DanDomain’s entry-level pricing is about average for the 5GB of disk space that you’ll get, but the lack of MySQL functionality means that it’s not suitable for any medium or large-sized website — or even a small WordPress website. Their mid-tier “Websolution” plan is twice the price, but in line with what you will find elsewhere for 1GB MySQL database storage and 15GB of disk space. However, despite costing only about twice the price, the highest-tier plan offers 5GB MySQL database storage and 50GB of disk space. That’s a great value-to-price ratio that will leave many small and medium businesses struggling to find the right price point for their needs. But for larger enterprises, the huge amounts of performance are larger than the maximums you’ll find at many other popular competitors. If you are currently a large e-commerce store — or a store with ambition — you can be confident that DanDomain will be able to handle your traffic no matter how large your online presence becomes. If you need help, DanDomain offers native Danish support over the phone on weekdays, but not weekends or holidays. You can elect to call the number listed on their website for support, or fill out a form and have them call you back. Email responses can take a few days. However, there is a fairly robust self-help knowledge base that can answer most basic questions. DanDomain offers good e-commerce functionality, but small and medium-sized stores may find it a bit difficult to find the perfect price point. But given that prices are relatively reasonable overall and that their top-tier plans are powerful enough to handle growth, DanDomain remains an excellent option for all kinds of webmasters. Wondering how DanDomain stacks up against other Web Hosting companies? Enter any other Web Hosting company and we will give you a side-by-side comparison.